Goals per game per team - a Poisson distribution! Sometimes, a simple model which provides reasonable amounts of uncertainty is much wiser than a model that considers too many variables and too much information. Yes indeed, too much information can lead to more noise in the results and, even worse, can make us believe we are interpreting better data. And so the 338 hockey model is quite simple as it stands now (January 14th 2019). It takes into account goals for, goals against, home & away teams, shot % and save %. That's it. Another important aspect: Away games and home games are treated independently, so the performance of a team at home doesn't affect its away stats and vice versa. The model takes into account games that have been played so far this season and simulates the rest of the regular season 50k times based on stats accumulated so far. Based on these 50k simulations, the model then calculates the playoff qualification odds, final point projections, and so forth. 2. 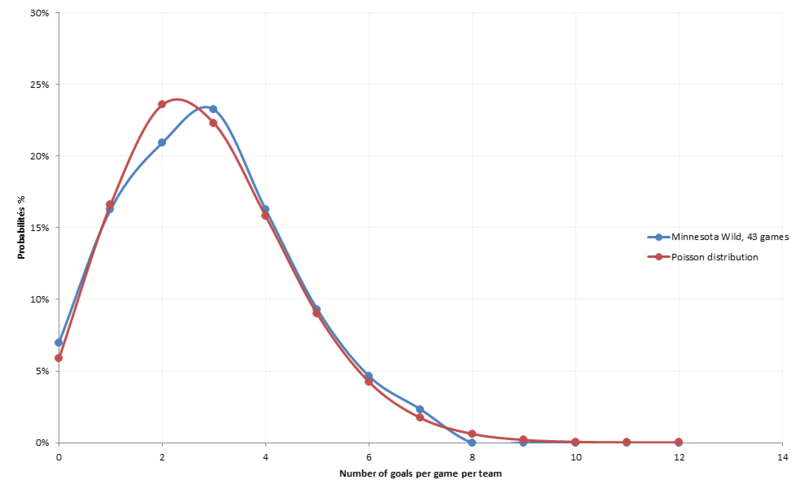 Goals per game per team - a Poisson distribution! 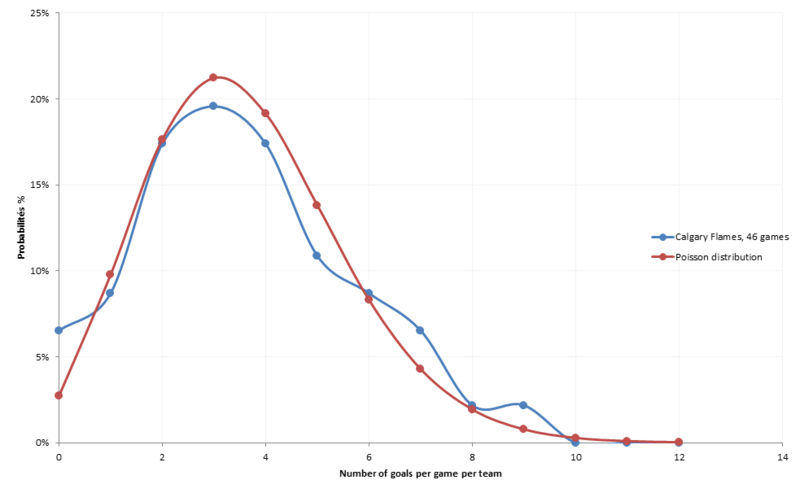 The red curve is the theoretical Poisson distribution of goals for per game per team of the 2017-2018 season, where the league average was 2.97 goals per team per game. 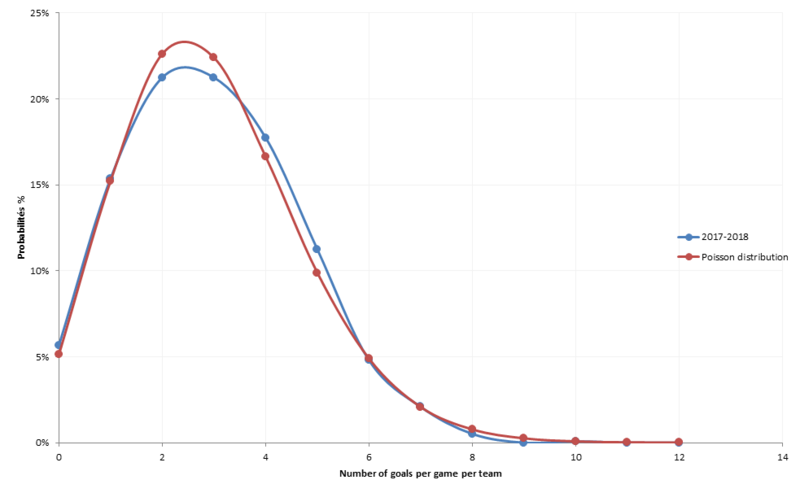 The blue curve is the actual results of amount of goals per team per game during said season - all 1271 games considered. It's eerily close to a perfect Poisson distribution. And sometimes, of course, the same size is too small to fit the curve. Go home, Philadelphia Flyers - you're drunk. I will test the model for the remainder of the 2018-2019 season and adjust new parameters as we go along. The model is not supposed to call every game right. In a team parity league like the NHL, even a team low in the standings can have a good night and beat the league leading team. However, odds that a 25th to 31st place team beats a top five team are low, so the model should obtain above average results in the long run. 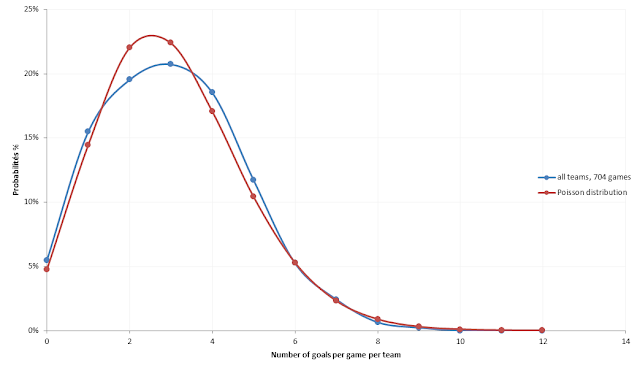 The success rate is the number of games whose winner was calculated as the favourite the morning of the game. Every game is labeled either as a Toss-up, Leaning or Likely. 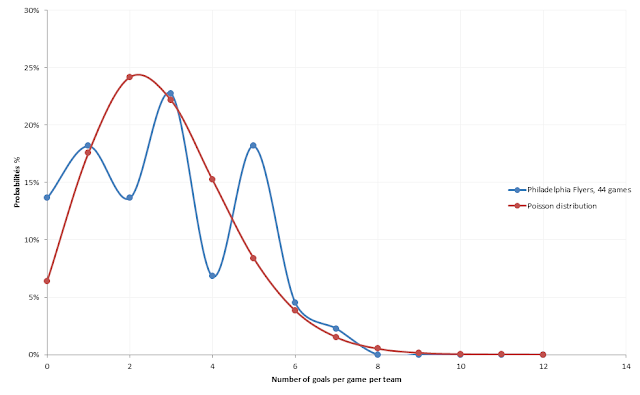 Therefore, if the model is accurate, it should call the correct winner in certain fraction of games depending on whether the favourite was likely, leaning, or if the game was a toss-up. This is what is called the expectancy rate. (See table on main page). If the success rate is much higher than the expectancy rate, then either the favourite odds are underestimated or it's been lucky. In the long run however, the luck factor should fade. 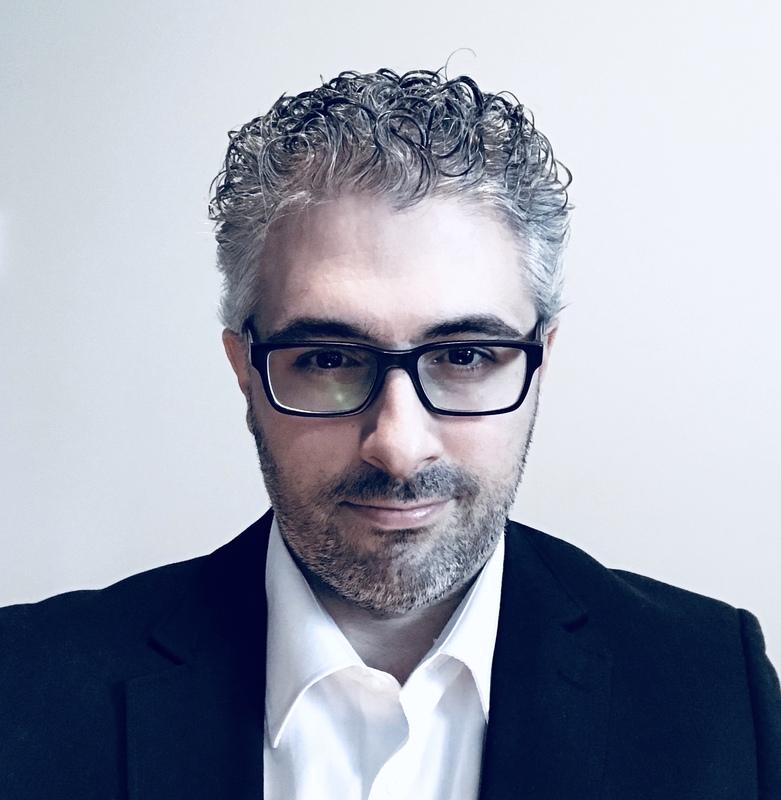 If the success rate is much lower than the expectancy rate, then either the model picks the wrong favorites too often (so the favourite odds are overestimated) or it's been unlucky. 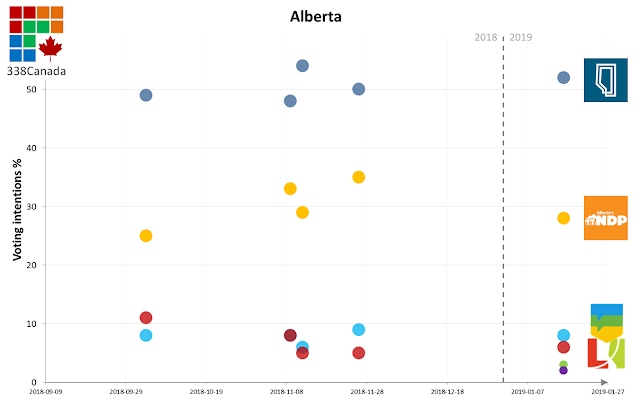 Early in January 2019, when the model was in its first few nights, it picked the wrong winner in twelve of the first fifteen toss-ups. It made me cringe and think that maybe the model was wrong, but it has picked up the pace since with toss-ups. It had just been unlucky on its first nights. At the end of the season, if the success rates are close to the expectancy rates, I'll be satisfied. Then' I'll try to obsess on more telling data to help make the model better. 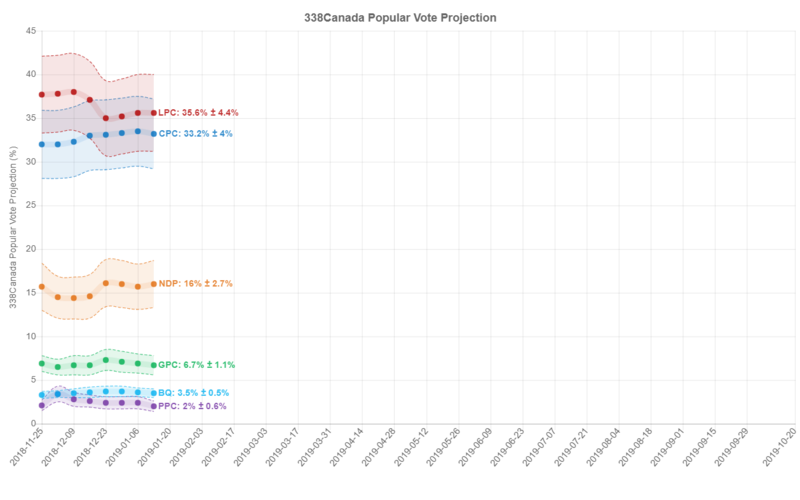 The New Democratic Party still stands far behind its main competitors at an average of 24 seats. 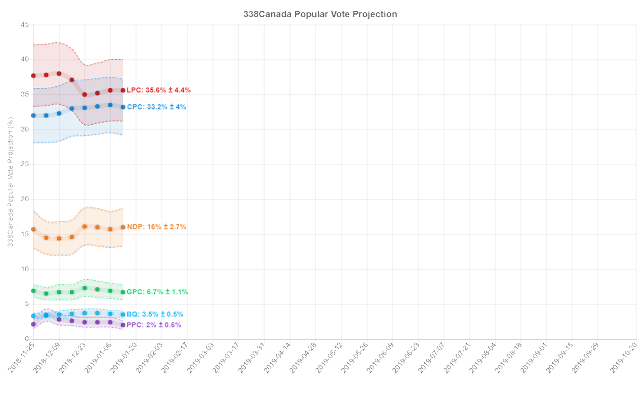 Even a result close to 2015's 44 seats look all but impossible according to current data. 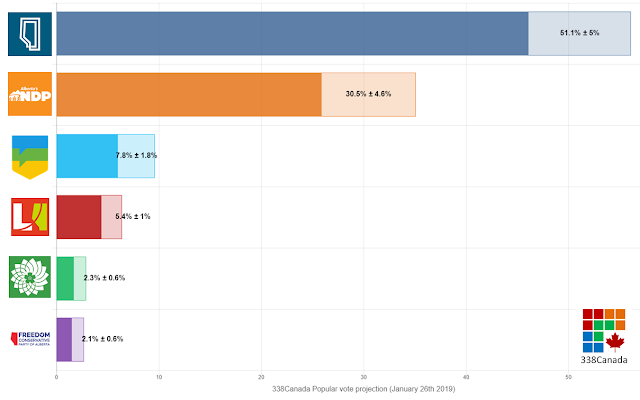 In Québec, numbers for the Bloc québécois remain highyl uncertain. The curve below indicate however that the needle has not moved much since Yves-François Blanchet announced his candidacy for the leadership. We'll see in the coming weeks whether that changes or not. 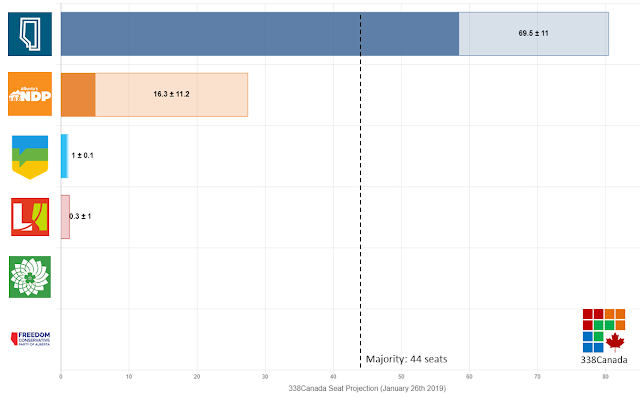 Lastly, the Green Party of Canada looks to be in a fairly good position to make modest gains. In 2015, only Green leader Elizabeth May had won a riding under the GPC banner.